What's different about mobile learning? As the doors open to a new era of mobile learning and performance support, it's a good time to step back and think about the new mindset required when designing for mobile. Although a mobile pedagogy will continue to evolve, we already know quite a bit about how people use mobile devices and some of the advantages of mobile learning. It doesn't take much deep thought to realize that mobile devices are an ideal medium for supporting performance at work. 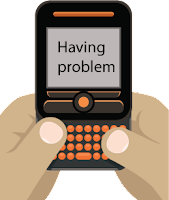 When an employee runs into an unsolvable problem, requires information to complete a task or needs step-by-step advice, this type of need can often be filled through mobile performance support. Learning and support at work can be provided through one's network of professional colleagues, both internal and external to the workplace. Using mobile devices, the geographically dispersed workforce can help each other solve problems and make decisions in real time when the desktop is isn't convenient. And of course, mobile devices can also be used for voice communication. That's an old-fashioned and highly collaborative approach. The gestural user interface (UI) for interacting with a smartphone or tablet seems like another universe when compared to one-finger clicking on a mouse. The gestural UI removes the intermediary device (mouse, pen, etc.) so that users can directly manipulate objects on the screen. Objects are programmed to move and respond with the physics of the "real world." This opens up a new world of design possibilities for creative imaginations. Learner-centric experiences occur when a person seeks the answer to an internal question. At this moment of need, the individual is highly motivated to learn and remember. When this occurs, it circumvents the need for extrinsic motivational techniques. Instead, it demands more effective information design, to provide quick and searchable access to content. Although there are bound to be an increasing number of Learning Management Systems that track mobile learning events, the mobile medium seems better suited to informal learning. Because mobile devices are often ubiquitous as well as always connected, they are ideal for learning in a variety of ways to fit a particular time and place. 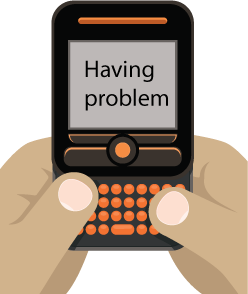 Unlike other types of learning, mobile learning on a smartphone or tablet can occur in context. Only 3D simulations come close to this. Mobile learning may be initiated in the context of a situation, such as a few minutes of instruction prior to a sales call or quickly looking up a technical term at a meeting. Mobile learning may be initiated in the context of a location, such as augmented reality to learn about a place while traveling or getting directions to the next technical service call. And if employees "check in" to a location-based site, they can find each other anywhere around the world. By taking advantage of smartphone and tablet hardware, users can generate content by taking photographs and recording video and audio. Through these multimedia capabilities, your workforce can send and receive information from the field. A healthcare worker in a rural area can send photos of a patient's skin condition and ask for help with a diagnosis. An agricultural expert can create a photo album for farmers, showing conditions that indicate soil erosion. Rather than take notes, a trainer can voice record his or her thoughts on how to improve a workshop. Then use this recording back at the office. The most popular apps in iTunes are games. With mobile devices, games don't need to be limited to the phone. They can take in the larger world and be situational. For example, at a call center technicians receive digital badges through a mobile app for every satisfied caller. Badges are cashed in for various rewards. Think about ways to improve performance through challenges, team competitions and gamification. Take advantage of the hardware features of mobile devices. They have sensors for detecting touch, motion and device orientation. There is hardware for connecting through your carrier's network, and through WiFi and Bluetooth. Some mobile devices can be used for tethering, which involves connecting the phone to a laptop with a cable and using the carrier as a modem to connect to the Internet. Mobile devices are also beginning to use Near Field Communications (NFC), so that devices can transmit information by touching them or coming into close proximity. How can we leverage all that's unique about mobile devices and their use and at the same time, avoid the pitfalls? It will take time, thought and a high-level strategy to get it right. Your thoughts? Connie Malamed (@elearningcoach) publishes The eLearning Coach, a website with articles, resources, reviews and tips for learning professionals. She is the author of Visual Language for Designers and the Instructional Design Guru iPhone app. eLearning and slide presentations are highly visual mediums. The visual clarity of screens and slides can have a big impact on learning. If you're unsure what to do and how to go about designing the visuals for a training environment, here are some quick tips that might help. You solve problems all day long and you're probably pretty good at it. Coming up with a visual design is no different than other problems you must solve. First, define the visual problem (identify the goal and constraints); get ideas by brainstorming, sketching and researching what others have done; make decisions (ideally with input from others); and find a way to execute your solution. You're the painter. 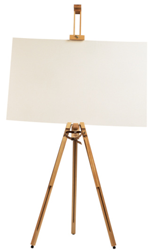 Think of the screen as a blank canvas. Don't let it be defined by an existing template. Start fresh by throwing away the standard approach with the title at the top and the content below. You might need it at times, but it will limit your potential solutions if you hang on to that approach at first. Without studying typography, it's difficult to know what typeface to use for an eLearning course or a slide deck. You can simplify this decision by using only ONE typeface in a course. A typeface that has several styles. Certainly bold and italic are necessities, but also heavy and condensed styles add more options. Then consistently vary this one typeface, as appropriate, using different sizes, weights and colors for different purposes. Some of my favorites: Myriad Pro, Helvetica, Franklin Gothic, Garamond, Gill Sans, Futura and Times. We organize our perceptions according to certain brain rules. One of these is the Law of Proximity. When elements are placed close together, we assume there is a relationship between the elements. Use proximity to indicate which elements are related to each other so learners will know they are part of a group. Avoid using proximity when elements are not related, so you don't give learners the wrong idea. 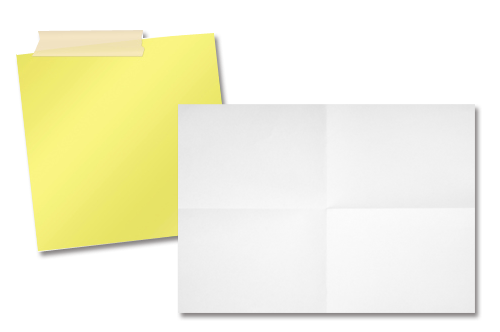 One way to give a design personality is to use a paper background for text or images. Don't overdo it, of course. For example, if you want to add a touch of informality, you might display text on a little note with masking tape or a paper with fold lines, as shown below. If you're going formal, perhaps a finely textured linen paper would work. 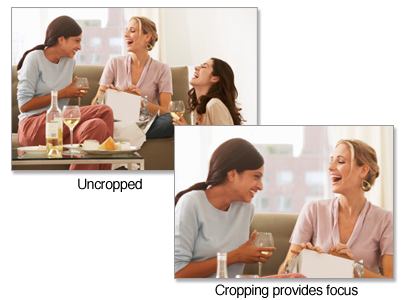 Stock photo sites sell paper backgrounds or you can digitize one yourself. Think of visual space as an element of design, similar to image and text. Space and form are the yin and yang of visual design; without one, you can't have the other. White space or negative space refers to the area between and around elements and between elements and the edge of the screen. Use white space to provide balance and clarity to your design. This makes it easier for learners to process the visual information. Your photographs will have more impact if you crop them to show only what's important. Most photos have extraneous visual information that may detract from your purpose. Examine each photo you use and identify where you want the viewer to focus. Then crop the photo so the focal point becomes predominant. There's almost never a reason to go crazy with colors (I can't think of one, but I'm sure somebody will). Generally, using too many colors will confuse your learners, making it harder for them to focus on what's important. Simplify your palette to a few subdued and compatible colors. Then add one or two contrasting colors for accent and emphasis. A sense of unity will make your visual design feel like one integrated composition. One way to create this sense of integration is to repeat certain design elements. If you use some of the techniques in this article, repeat them in a consistent way. This creates a connection between the elements. The trick is to use visual repetition without getting boring. What will your training role be in the future? After TechKnowledge 2012, I was inspired to think again about the role that learning and development professionals can look forward to in the future. For those who remain flexible and partake in continuous learning, I think the 21st century will be filled with exciting opportunities. With cultural shifts slipping into the workplace, technologies changing at rapid speed, and an improved understanding of how adults learn, it's not surprising that many in our field are wondering what their training-related job might look like in the future. One thing seems nearly certain—as time passes, the role of the training professional and instructional designer will be transformed. This is why various titles for our new role are being suggested, such as "Learning Experience Designer" and "Learning Architect" (see review of Clive Shepherd's book, The New Learning Architect). There are many ways to imagine what will happen based on what is occurring today. One way to organize our thoughts about the future of the training and development professional is to think in terms of four roles that are based on how people learn, create, network, and collaborate. It seems feasible that all future roles could be based on this type of understanding, as represented in the diagram below. Possible future roles of the Learning and Development professional. Start with the core and work outward. Each role defined here moves progressively further away from the traditional course design role. Perhaps the individual Learning and Development (L & D) professional will fulfill several of these roles simultaneously. 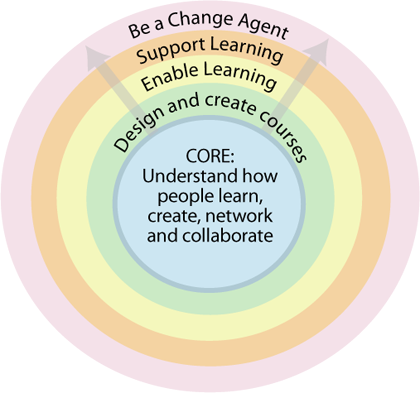 Design and Create Courses: This is currently the most well-used role in the L&D repertoire. It involves using a systematic process to design and develop (and sometimes teach) courses and supplementary materials, such as performance support tools, for a specific workforce. The range of methodologies for doing should continue to expand. Using anything from the ADDIE model and it's many adaptations, to Thiagi's Four Door Model to Rapid eLearning development, there are many organizations who will continue to require courses for compliance, new hire and other types of structured training. Enable Learning: In this role, the L&D professional provides opportunities for a motivated workforce to learn and grow. These opportunities may be structured or unstructured, but they need not be tracked and have a certain informality and free flow to them. For example, setting up communities of practice, putting on special events with experts and teaching interested employees about enterprise collaboration tools are all ways to enable learning. Support Learning: In this more learner-centric approach, employees choose how and when they need to learn, dependent on their job tasks and interests. They may use the L&D professional as a resource for getting the on-demand information and training to meet their personal needs. For example, an L&D professional could moderate an online community, work with IT to design a social network or ensure there are no obstacles in the way of employee's creating their own Personal Learning Environments. 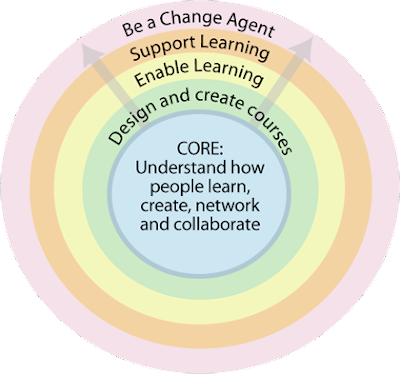 Be a Change Agent for Development: In this role, the L&D professional envisions and champions critical transformations that are necessary for an organization to move forward. Savvy L&D professionals will be able to see where obstacles exist and provide insight and leadership for implementing innovative solutions, particularly as they affect professional development. What do you think the future role of the training professional will be? 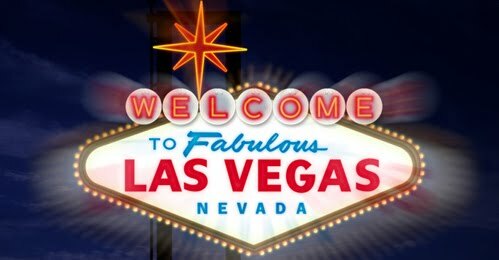 When it comes to conferences, a better slogan would be, "What happens in Vegas should NOT stay in Vegas." If you're one of the fortunate people from your organization to attend a professional conference, how can you bring it back to the workplace so everyone can benefit? During sessions, keynotes, hallway conversations and after-hours discussions, many great ideas are tossed around. Don't let them stay in Vegas! Share them when you get back. Sharing what you've learned will not only benefit others in your workplace, it may help you take better notes and stay more organized during the conference. The pressure of knowing that you'll need to convey the best of the conference tends to help a person plan ahead. If you're ready to hone your leadership skills, here are ten ideas for how you can bring the conference back to work to share the knowledge gained with others. Do you enjoy being hunched over your keyboard and typing furiously? Then this approach is for you. Every so often, you'll see a session participant madly taking notes to capture the essence of a session. Often, this person is Cammy Bean, the Queen of Live Blogging. 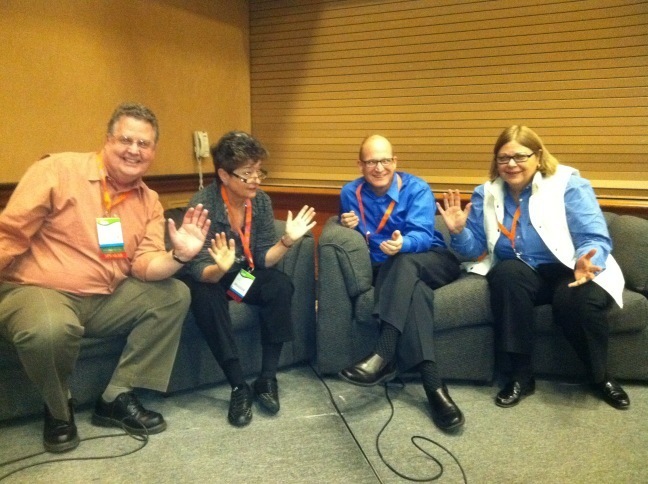 Check out her live blogging notes from TechKnowledge 2012 (scroll down to see all of her notes). If you work in a small organization, throw a series of brown bag seminars over the lunch hour to present and discuss some of your favorite sessions. Break down the silos and invite people from outside your department who might have an interest in a particular topic. If your organization is large and geographically dispersed, consider presenting key teachings from the conference during one or more live webinars. Allow for questions and answers as well as discussion. If you don't currently own or subscribe to a webinar platform, this is the perfect time to try one out. There are usually 30-day free trials. The backchannel typically refers to audience members using Twitter to share session points and to comment in real time. Backchannel curation refers to researching and gathering all the documentation regarding an event. It provides a way for people to attend a conference virtually, to catch up on missed sessions and to continue to learn after the event ends. You can curate the conference backchannel for interested people in your organization. Or you can rely on the King of Backchannel Curation, David Kelly, to do an excellent job. Here is his curated backchannel of TechKnowledge 2012. Not interested in live blogging? Take judicious notes and then blog about what you've learned after the conference is over. If your organization doesn't have an internal blogging platform, consider a light blogging platform like Tumblr. It's very easy to get started. Then be sure to share posts with your peers. Gather employees with common interests together and chat about issues and trends discussed at the conference. Let the conference topics be a starting point or stimulus for taking things further. Are employees spread around the world? Use Google+ Hangouts, which allows for free video chats of up to 10 people. Use SlideShare, Prezi or another online presentation tool to create a self-paced review of the best of the conference. This is a good way to reach out to employees around the world and to allow busy people to learn on their own schedule. Did you connect with vendors who have products that could meet the needs of your organization? Most vendors provide in-person or virtual demonstrations. Schedule a few product demonstrations and invite experienced designers and developers to evaluate the products. Most presenters I know are passionate about their topics. That's one of the reasons they enjoy presenting. You might be able to arrange a webinar or teleseminar question and answer session with a presenter to go more deeply into their areas of expertise. Although an unscripted question and answer session is exciting, it's probably wise to gather some questions from your community ahead of time. Pass these on to the speaker so he or she can be well-prepared. This will allow the speaker to better understand the audience's main areas of interest. Then allow some time for impromptu questions and comments as well. Many speakers have written books or often suggest books for further reading during their presentations. They will also be able to recommend books in their area of expertise if asked to do so. A great way to bring a conference back to work and to continue learning is to gather a group of peers with similar goals and interests to read and discuss one book a month related to a presentation topic. Discussions can be face-to-face or online. Imagine how much you would learn in one year! How do you bring the essence of a conference back to your workplace? Or if you're unable to attend a conference, how would you like others to share what they've learned? Much thanks to Karl for guest blogging in January. He not only offered some insightful posts about how “gamification” is affecting the world of learning, he kept us abreast of happenings at ASTD TechKnowledge 2012. In February, the LC Blog invites Connie Malamed to take the helm. Connie is a frequent contributor to Learning Circuits, and has spoken at several ASTD events about the fields of online learning, information design, and visual communication. She is also the author of Visual Language for Designers, which presents visual design principles that are based on cognitive science. In other words, it explains how to design for the human mind—something that’s very important in e-learning. However, Connie is probably most well-known for The eLearning Coach (http://theelearningcoach.com), which is her own blog where she shares actionable strategies, practical content, product reviews, and resources to help practitioners design, develop, and understand online learning. Indeed, with degrees in Instructional Design and Art Education, she energetically pursues ways to improve instructional and information graphics. Following Karl’s lead, Connie promises to pass along to readers what she learned at ASTD TechKnowledge, as well as lend her thoughts on visual design and discuss current trends in our field. Well, finally getting back into the swing of things after a great conference in Las Vegas. 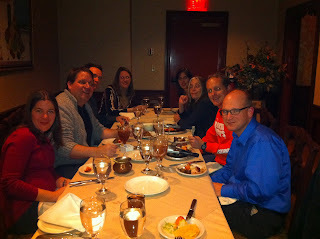 The TechKnowledge 2012 was fun, educational and a great time. It started with me being on the same plane as Stevie Rocco who, among other things presented a creation station called Yippee! It's Free! Low- and No-Cost Tools for Training and Development. We had a great chat and discussion waiting for a cab...then she got in one cab, I got into another with a couple of other conference attendees and I never saw Stevie again at the conference, the irony is that we only live about an hour from each other and we had to travel clear to Las Vegas to see each other...ah the nature of conferences. Then I had some conference calls and went down to eat dinner by myself and ran into an alum of the program, Andy Shean who works at Success Factors. We had a great dinner and caught up with Bloomsburg happenings. The next day I caught up with all the great ASTD folks who run such an effective conference. Always a pleasure speaking at a conference where they take such good care of you!!! Then I did a presentation, you can obtain all the links at my TechKnowledge 2012 Presentation Resources post. Next, I had my book signing, THANKS CURT for stopping by...very much appreciated. 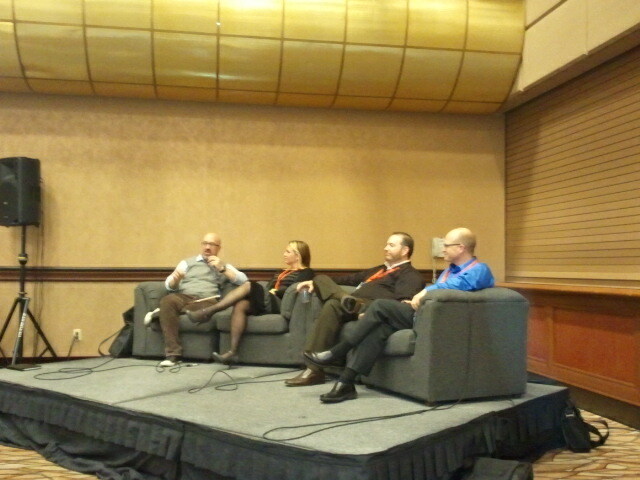 Then off to my TK Chat on Gamification. Here I am on the panel with Kris Rockwell, Koreen Olbrish, Rick Raymer and myself. Then I was on a panel with some great ID professors, we didn't have many attendees but we had a lively and fun discussion. We had talked about holding the session in the bar, maybe next time. Here are Steve Villachica, Allison Rossett, me and Ellen Wagner acting a little stir crazy with all visions of ID dancing in our heads. Later I joined a couple of folks from Adobe including fellow professor Allen Partridge and Connie Malamed of The eLearning Coach and elearning Brother Andrew of eLearning Brothers, plus Beverly Roberts from Virginia Commonwealth University and author and owner of Artisan E-Learning Diane Elkins, Marcia Mendonca Lima Wright join us as well as Charles Welsh.